I recently had a simple-sounding desire. I would like to run the latest stable version of Digikam. My desktop, however, runs Debian stable, which has 5.3.0, not 5.9.0. This is not such a simple proposition. And many of those were required at versions that weren’t in stable. I had long thought that AppImage was a rather bad idea, but I decided to give it a shot. I realized it was worse than I had thought. About a year ago, I wrote about the problems Docker security. I go into much more detail there, but the summary for AppImage is quite similar. How can I trust all the components in the (for instance) Digikam AppImage image are being kept secure? Are they using the latest libssl and libpng, to avoid security issues? How will I get notified of a security update? (There seems to be no mechanism for this right now.) An AppImage user that wants to be secure has to manually answer every one of those questions for every application. Ugh. Nevertheless, the call of better facial detection beckoned, and I downloaded the Digikam AppImage and gave it a whirl. The darn thing actually fired up. But when it would play videos, there was no sound. Hmmmm. Nasty. I spent quite some time trying to make ALSA work, before a bunch of experimentation showed that if I ran alsoft-conf on the host, and selected only the PulseAudio backend, then it would work. I reported this bug to Digikam. Then I thought it was working — until I tried to upload some photos. It turns out that SSL support in Qt in the AppImage was broken, since it was trying to dlopen an incompatible version of libssl or libcrypto on the host. More details are in the bug I reported about this also. These are just two examples. In the rather extensive Googling I did about these problems, I came across issue after issue people had with running Digikam in an AppImage. These issues are not limited to the ALSA and SSL issues I describe here. And they are not occurring due to some lack of skill on the part of Digikam developers. Rather, they’re occurring because AppImage packaging for a complex package like this is hard. It’s hard because it’s based on a fiction — the fiction that it’s possible to make an AppImage container for a complex desktop application act exactly the same, when the host environment is not exactly the same. Does the host run PulseAudio or ALSA? Where are its libraries stored? How do you talk to dbus? And it’s not for lack of trying. The scripts to build the Digikam appimage support runs to over 1000 lines of code in the AppImage directory, plus another 1300 lines of code (at least) in CMake files that handle much of the work, and another 3000 lines or so of patches to 3rd-party packages. That’s over 5000 lines of code! By contrast, the Debian packaging for the same version of Digikam, including Debian patches but excluding the changelog and copyright files, amounts to 517 lines. Of course, it is reusing OS packages for the dependencies that were already built, but this amounts to a lot simpler build. Frankly I don’t believe that AppImage really lives up to its hype. Requiring reinventing a build system and making some dangerous concessions on security for something that doesn’t really work in the end — not good in my book. But of course, AppImage exists for a reason. That reason is that it’s a real pain to deal with so many levels of dependencies in software. Even if we were to compile from source like the old days, and even if it was even compatible with the versions of the dependencies in my OS, that’s still a lot of work. And if I have to build dependencies from source, then I’ve given up automated updates that way too. There’s a lot of good that ELF has brought us, but I can’t help but think that it wasn’t really designed for a world in which a program links 396 libraries (plus dlopens a few more). Further, this world isn’t the corporate Unix world of the 80s; Open Source developers aren’t big on maintaining backwards compatibility (heck, both the KDE and Qt libraries under digikam have both been entirely rewritten in incompatible ways more than once!) The farther you get from libc, the less people seem to care about backwards compatibility. And really, who can blame volunteers? You want to work on new stuff, not supporting binaries from 5 years ago, right? I don’t really know what the solution is here. Build-from-source approaches like FreeBSD and Gentoo have plenty of drawbacks too. Is there some grand solution I’m missing? Some effort to improve this situation without throwing out all the security benefits that individually-packaged libraries give us in distros like Debian? Awhile back, I wrote about my Debian Docker base images. I decided to extend this concept a bit further: to running DOS applications in Docker. It turns out this is possible, but difficult. I went through all three major DOS emulators available (dosbox, qemu, and dosemu). I got them all running inside the Docker container, but had a number of, er, fun issues to resolve. The general thing one has to do here is present a fake modem to the DOS environment. This needs to be exposed outside the container as a TCP port. That much is possible in various ways — I wound up using tcpser. dosbox had a TCP modem interface, but it turned out to be too buggy for this purpose. The challenge comes in where you want to be able to accept more than one incoming telnet (or TCP) connection at a time. DOS was not a multitasking operating system, so there were any number of hackish solutions back then. One might have had multiple physical computers, one for each incoming phone line. Or they might have run multiple pseudo-DOS instances under a multitasking layer like DESQview, OS/2, or even Windows 3.1. (Side note: I just learned of DESQview/X, which integrated DESQview with X11R5 and replaced the Windows 3 drivers to allow running Windows as an X application). For various reasons, I didn’t want to try running one of those systems inside Docker. That left me with emulating the original multiple physical node setup. In theory, pretty easy — spin up a bunch of DOS boxes, each using at most 1MB of emulated RAM, and go to town. But here came the challenge. In a multiple-physical-node setup, you need some sort of file sharing, because your nodes have to access the shared message and file store. There were a myriad of clunky ways to do this in the old DOS days – Netware, LAN manager, even some PC NFS clients. I didn’t have access to Netware. I tried the Microsoft LM client in DOS, talking to a Samba server running inside the Docker container. This I got working, but the LM client used so much RAM that, even with various high memory tricks, BBS software wasn’t going to run. I couldn’t just mount an underlying filesystem in multiple dosbox instances either, because dosbox did caching that wasn’t going to be compatible. This is why I wound up using dosemu. Besides being a more complete emulator than dosbox, it had a way of sharing the host’s filesystems that was going to work. So, all of this wound up with this: jgoerzen/docker-bbs-renegade. I also prepared building blocks for others that want to do something similar: docker-dos-bbs and the lower-level docker-dosemu. As a side bonus, I also attempted running this under Joyent’s Triton (SmartOS, Solaris-based). I was pleasantly impressed that I got it all almost working there. So yes, a Renegade DOS BBS running under a Linux-based DOS emulator in a container on a Solaris machine. He was hooked. So I thought that taking it to the next level would be a good thing for a rainy day. I have run Asterisk before, though I had unfortunately gotten rid of most of my equipment some time back. But I found a great deal on a Cisco 186 ATA (Analog Telephone Adapter). It has two FXS lines (FXS ports simulate the phone company, and provide dialtone and ring voltage to a connected phone), and of course hooks up to the LAN. I set up voicemail. He loved it. He promptly figured out how to record his own greetings. We set up a second phone on the other line, so he could call between them. The cordless phones in our house support SIP, so I configured one of them as a third line. He spent a long time leaving himself messages. 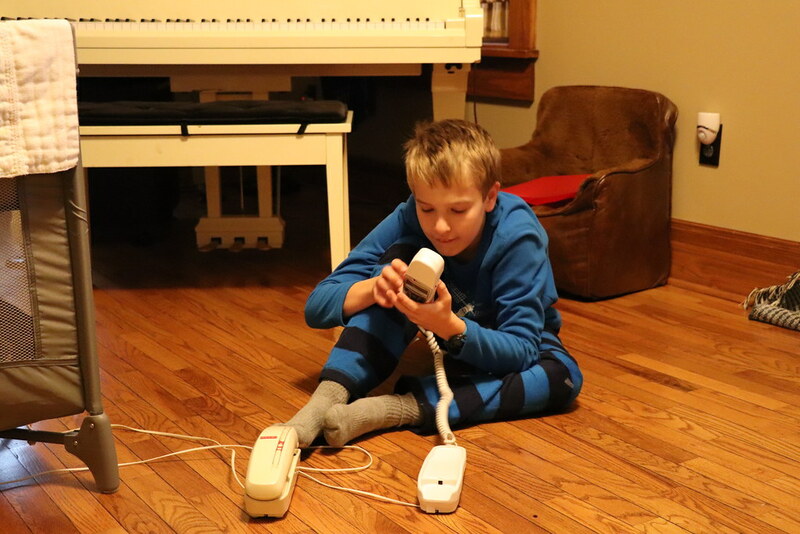 Then I found an online source for streaming NOAA Weather Radio feeds – Jacob enjoys listening to weather radio – and I set up another extension he could call to listen to that. More delight! He has informed me that next Saturday we will build an intercom system “like we have at school.” I’m going to have to have some ideas on how to tie Squeezebox in with Asterisk to make that happen, I think. Maybe this will do. There are a lot of tutorials out there on the Internet that get you about halfway there, so here is some more detail. In this article, I will be focusing on authentication in the style of Google Authenticator, which is a special case of OATH HOTP or TOTP. You can use the Google Authenticator app, FreeOTP, or a hardware token like Yubikey to generate tokens with this. They are all 100% compatible with Google Authenticator and libpam-google-authenticator. The basic idea is that there is a pre-shared secret key. At each login, a different and unique token is required, which is generated based on the pre-shared secret key and some other information. With TOTP, the “other information” is the current time, implying that both machines must be reasably well in-sync time-wise. With HOTP, the “other information” is a count of the number of times the pre-shared key has been used. Both typically have a “window” on the server side that can let times within a certain number of seconds, or a certain number of login accesses, work. The beauty of this system is that after the initial setup, no Internet access is required on either end to validate the key (though TOTP requires both ends to be reasonably in sync time-wise). You can start with the basics by reading one of these articles: one, two, three. Debian/Ubuntu users will find both the pam module and the user account setup binary in libpam-google-authenticator. Let’s consider a scenario in which your system is completely compromised. Unless your ssh keys are also stored in something like a Yubikey Neo, they could wind up being compromised as well – if someone can read your files and sniff your keyboard, your ssh private keys are at risk. So we can configure ssh and PAM so that a OTP token is required even for this scenario. This basically makes Google Authenticator both necessary and sufficient for keyboard-interactive in ssh. That is, whenever the system wants to use keyboard-interactive, rather than prompt for a password, it instead prompts for a token. Note that any user that has not set up google-authenticator already will be completely unable to ssh into their account. On many of my systems, I have ~root/.ssh/authorized_keys set up to permit certain systems to run locked-down commands for things like backups. These are automated commands, and the above configuration will break them because I’m not going to be typing in codes at 3AM. This says that the only way to access the root account via ssh is to use the authorized_keys file, and no 2FA will be required in this scenario. This means that to authenticate, you need to pass either publickey and then keyboard-interactive auth, or just keyboard-interactive auth. As a sub-variant for option 1, you can add nullok to here to permit auth from people that do not have a Google Authenticator configuration. Or for option 2, change “required” to “sufficient”. You should not add nullok in combination with sufficient, because that could let people without a Google Authenticator config authenticate completely without a password at all. A lot of other tutorials stop with ssh (and maybe gdm) but forget about the other ways we authenticate or change users on a system. su and sudo are the two most important ones. If your root password is compromised, you don’t want anybody to be able to su to that account without having to supply a token. So you can set up google-authenticator for root. The reason you put this after pam_rootok.so is because you want to be able to su from root to any account without having to input a token. We add nullok to the end of this, because you may want to su to accounts that don’t have tokens. Just make sure to configure tokens for the root account first. This one is similar to su, but a little different. This lets you, say, secure the root password for sudo. Normally, you might sudo from your user account to root (if so configured). You might have sudo configured to require you to enter in your own password (rather than root’s), or to just permit you to do whatever you want as root without a password. If you want to require a token and a password, change the bracketed string to “required”, and if you want a token or a password, change it to “sufficient”. As before, if you want to permit people without a configured token to proceed, add “nullok”, but do not use that with “sufficient” or the bracketed example here. So now, with the combination of this and the PAM configuration above, I can sudo to the root user without knowing its password — but only if I can supply root’s token. Pretty slick, eh? First, the libpam-google-authenticator module supports putting the Google Authenticator files in different locations and having them owned by a certain user. You could use this to, for instance, lock down all secret keys to be readable only by the root user. This would prevent users from adding, changing, or removing their own auth tokens, but would also let you do things such as reusing your personal token for the root account without a problem. Also, the pam-oath module does much of the same things as the libpam-google-authenticator module, but without some of the help for setup. It uses a single monolithic root-owned password file for all accounts. There is an oathtool that can be used to generate authentication codes from the command line. Since I wrote last about Linux backup tools, back in a 2008 article about BackupPC and similar toools and a 2011 article about dedpulicating filesystems, I’ve revisited my personal backup strategy a bit. Remote end must not need any special software installed. Storage across rsync, sftp, S3, WebDAV, etc. should all be good candidates. The remote end should not need to support hard links or symlinks, etc. Cross-host deduplication at at least the file level is required, so if I move a 4GB video file from one machine to another, my puny DSL wouldn’t have to re-upload it. All data that is stored remotely must be 100% encrypted 100% of the time. I must not need to have any trust at all in the remote end. Each backup after the first must send only an incremental’s worth of data across the line. No periodic re-uploading of the entire data set can be done. The repository format must be well-documented and stable. So, how did things stack up? BackupPC requires software on the remote end and does not do encryption. None of the rsync hardlink tree-based tools are suitable here. rdiff-backup requires software on the remote end and does not do encryption or dedup. duplicity requires a periodic re-upload of a full backup, or incremental chains become quite long and storage-inefficient. It also does not support dedup, although it does have an impressive list of “dumb” storage backends. ZFS, if used to do backups the efficient way, would require software to be installed on the remote end. If simple “zfs send” images are used, the same limitations as with duplicity apply. The tools must preserve POSIX attributes like uid/gid, permission bits, symbolic links, hard links, etc. Support for xattrs is also desireable but not required. bup and zbackup are both interesting deduplicators, but do not yet have support for removing old data, so are impractical for this purpose. burp requires software on the server side. Obnam and Attic (and its fork Borg Backup) are both programs that have a similar concept at their heart, which is roughly this: the backup repository stores small chunks of data, indexed by a checksum. Directory trees are composed of files that are assembled out of lists of chunks, so if any given file matches another file already in the repository somewhere, the added cost is just a small amount of metadata. Obnam was eventually my tool of choice. It has built-in support for sftp, but its reliance on local filesystem semantics is very conservative and it works fine atop davfs2 (and, I’d imagine, other S3-backed FUSE filesystems). Obnam’s repository format is carefully documented and it is very conservatively designed through and through — clearly optimized for integrity above all else, including speed. Just what a backup program should be. It has a lot of configurable options, including chunk size, caching information (dedup tables can be RAM-hungry), etc. These default to fairly conservative values, and the performance of Obnam can be significantly improved with a few simple config tweaks. Attic was also a leading contender. It has a few advantages over Obnam, actually. One is that it uses an rsync-like rolling checksum method. This means that if you add 1 byte at the beginning of a 100MB file, Attic will upload a 1-byte chunk and then reference the other chunks after that, while Obnam will have to re-upload the entire file, since its chunks start at the beginning of the file in fixed sizes. (The only time Obnam has chunks smaller than its configured chunk size is with very small files or the last chunk in a file.) Another nice feature of Attic is its use of “packs”, where it groups chunks together into larger pack files. This can have significant performance advantages when backing up small files, especially over high-latency protocols and links. On the downside, Attic has a hardcoded fairly small chunksize that gives it a heavy metadata load. It is not at all as configurable as Obnam, and unlike Obnam, there is nothing you can do about this. The biggest reason I avoided it though was that it uses a single monolithic index file that would have to be uploaded from scratch after each backup. I calculated that this would be many GB in size, if not even tens of GB, for my intended use, and this is just not practical over the Internet. Attic assumes that if you are going remote, you run Attic on the remote so that the rewrite of this file doesn’t have to send all the data across the network. Although it does work atop davfs2, this support seemed like an afterthought and is clearly not very practical. Attic did perform much better than Obnam in some ways, largely thanks to its pack support, but the monolothic index file was going to make it simply impractical to use. There is a new fork of Attic called Borg that may, in the future, address some of these issues. There are a few other backup tools that people are talking about which do dedup. bup is frequently mentioned, but one big problem with it is that it has no way to delete old data! In other words, it is more of an archive than a backup tool. zbackup is a really neat idea — it dedups anything you feed at it, such as a tar stream or “zfs send” stream, and can encrypt, too. But it doesn’t (yet) support removing old data either. syncany is fundamentally a syncing tool, but can also be used from the command line to do periodic syncs to a remote. It supports encryption, sftp, webdave, etc. natively, and runs on quite a number of platforms easily. However, it doesn’t store a number of POSIX attributes, such as hard links, uid/gid owner, ACL, xattr, etc. This makes it impractical for use for even backing up my home directory; I make fairly frequent use of ln, both with and without -s. If there were some tool to create/restore archives of metadata, that might work out better.